Eleonora Martins Azevedo has done a 5 years course in Psychology. When she was 17 years old, she met Prem Baba. Through him she could understand herself better and understand why people suffered. This inspired her to study what Prem Baba had studied and she then took up Psychology. She is a Psychologist with Path of the Heart and Dharma Academy in Brazil. Psychology is the science of behavior and mind, including conscious and unconscious phenomena, as well as thought. A psychologist is a mental health professional who evaluates and studies behavior and mental processes. "I have done a 5 years course in Psychology. When I was 17 years old, I met Prem Baba. Through him I could understand myself better and understand why people suffered. This inspired me to study what Prem Baba had studied and I then took up Psychology. 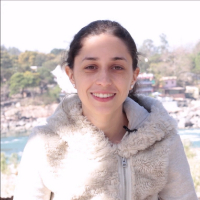 I am a Psychologist with Path of the Heart and Dharma Academy in Brazil."